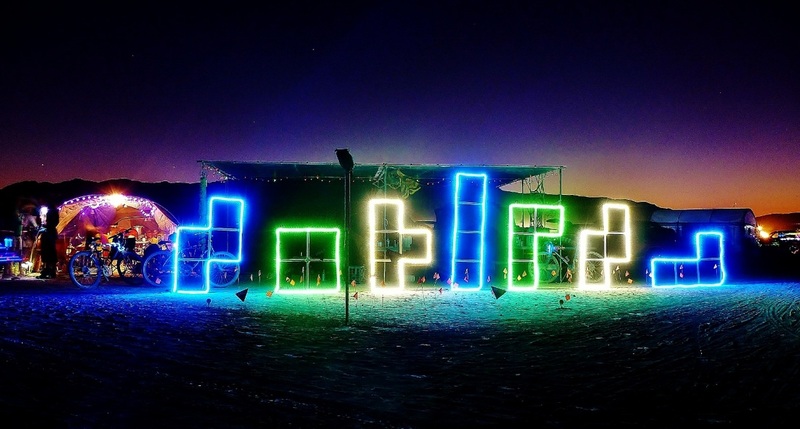 The Tetrominos sculpture was created for Camp Nerdgasm for the 2009-2011 Burning Man Festival. Placed on the corner 4-way crossing the sculpture illuminated the entire intersection, serving as a landmark and night time activity hotspot for event participants. Using the seven iconic shapes from the videogame TETRIS the sculpture acted as a beacon to attract nerds, dorks, and geeks of all walks of life to come into the camp to for a drink, music, good company, and join in on the overall debauchery. The color choice is inspired by the Gameboy's LCD screen the game debuted on in 1989. Designed to be mobile the entire sculpture can be dismantled to fit into 2ft x 1ft x 3.5ft container.